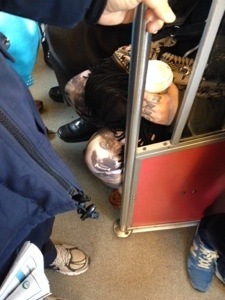 Cannibal clothes were spotted on a Vancouver-bound SkyTrain this morning. The gnarly tights were paired appropriately with moccasins and a misspelled finger tattoo. But, hey, whatever, you’ve got to be ‘craz’ to wear leggings that want to eat someone, anyways.